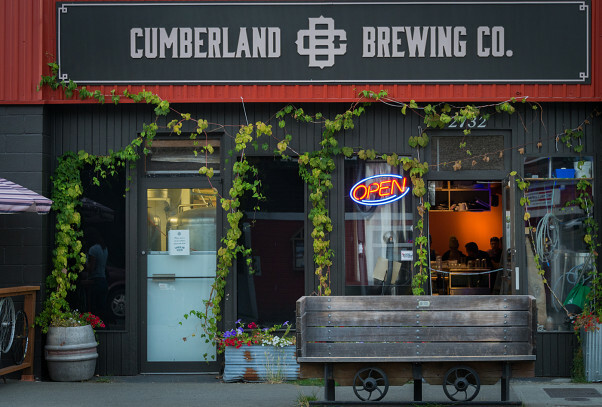 Deemed a tiny brewery in a thirsty village, check the Cumberland Brewing Company—affectionately known as the CBC—is making a big impression on residents of Cumberland as well as the entire Comox Valley. Since its official opening day on December 23, 2014, the petite brewery has been continuously and increasingly busy. In fact, the brewery has exceeded their initial sales expectations to the point where they have now reached their third year projections. Created by a trifecta of complex personalities that combine to form a perfect brew of business acumen, the Cumberland Brewing Company is owned by Caroline Tymchuk and Darren Adam, while Michael Tymchuk is the official brewmaster. Their business cards describe their relationship accurately and succinctly— Caroline Tymchuk counts the beer, Adam sells the beer, and Michael Tymchuk makes the beer. I was fortunate enough to enjoy a glass of my favorite CBC brew—an oatmeal stout called Dancing Linebacker—and speak with both Darren Adam and Michael Tymchuk at a table on their funky and popular outside patio. Though they officially opened in December of last year, the process commenced months before. “We put our hat over the fence in November of 2013,” recalls Adam. “We entered our business space in early August 2014 and officially opened the brewery five months later, for a total of about 14 months. Though that may seem like a long time to some, according to Adam it was a fast turnaround. “Normally it takes three to five years to get a brewery going,” he says. Even so, wading through the long lists of regulations and licensing permits related to the Liquor Control and Licensing Branch was a trial they would have liked to avoid. Thankfully, the trio eventually came out on the other side, liquor licence in hand, and they were able to focus, instead, on the process of making beer—a wonderful combination of art, science, and luck that Tymchuk has down pat. Both Adam and Tymchuk describe brewing beer as a mix between cooking and baking. “It’s the science of baking but the whimsy of cooking,” says Adam. Beer is derived from only four ingredients—water, malted barley, hops, and yeast—yet the complexity of tastes and aromas one can achieve from this short list of humble ingredients is truly staggering. Essentially, beer is a symphony of chemical reactions between the grain, the water, the yeast and the hops. Though beer existed long before the use of hops, most beer today is flavored with hops’ cone shaped flowers, which add flavor, aroma and stability to the finished product. Just like wine grapes, the region where the hops are grown lend flavors and aromas that differ greatly. As a result, Tymchuk sources hops from around the world to give him a wide range of flavors to experiment with. With names such as mosaic, cascade, equinox, amarillo and brewer’s gold, the variety of hops Tymchuk chooses can lend each batch of beer a unique quality. 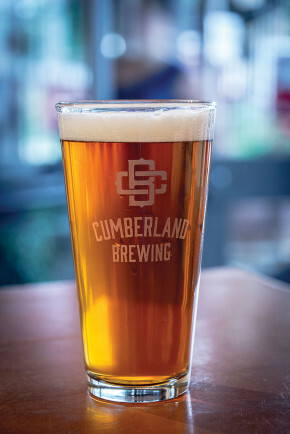 Currently, Cumberland Brewing Company has 17 varieties of hops on hand for creating their beer. “The hops, well they do all the work,” Tymchuk humbly states. But remember that beer commercial that stated, ‘it’s the water’? According to Tymchuk, that old adage is true, as the quality of the water is extremely important to the resulting beer. And they do—in fact, more often than not it’s difficult to find a seat. Since the new liquor laws were set in place, minors can now join their guardians in the brewery, which lends a fun community feel to the place. There are no TVs in the brewery and the tables are a hodgepodge collection of mismatched sizes and shapes. “There is a sort of charm in sitting on recycled chairs and furniture. We just sort of use what we have on hand,” Adam says. “It gets crowded at times so we will encourage people to share tables.” Sometimes Adam will help break the ice by doing false introductions. For example, he might introduce those joining the table as Nobel Peace Prize winners, and those sitting down as the current Donkey Kong champions. The end result is a friendly place where people of all ages meet new friends and share good conversation. Creating a sense of community by making the brewery a sort of community meeting place or hub has always been one of their goals. The brewery even has a community ‘Beer it Forward’ wall, where anyone can create a prepaid tab for a person or an organization. For example, right now there is a credit for the 442 Squadron of the Comox Air Force Base. There’s also a credit for members of the River Rats—those who volunteer to build and maintain the trails around Cumberland. According to Adam, the average commute to the Cumberland Brewery is six blocks. During our interview there was a steady stream of people coming in to refill their containers. Some drive to the brewery, but most walk, bike, or even skateboard. Adam believes that this trend toward local beer and breweries is a natural correction. “It’s a natural return to the order that was disturbed because of prohibition.” According to Adam, the result of that disturbance was a few large corporations mass producing watered-down beer, which they shipped and sold all over the world. Thankfully, Adam and Tymchuk don’t have any plans of doing the same. “We don’t have plans to distribute our beer. The idea is to keep things local. It’s better for the community and better for the environment too,” says Tymchuk. “Beer is heavy; shipping it all over the world is a bad idea.” Instead, customers can either stay in and have a glass at the brewery or they can take some home in a two-litre capacity growler or a one-litre squealer—either made of glass or insulated stainless steel, which keeps your beverage cold for up to 12 hours. Keeping things small also allows for more creativity. “Change is the only constant, but the beauty of being small and nimble is being able to change on a dime,” Adam notes. To anyone who walks by the brewery, it’s clear to see that the Cumberland Brewing Company is a popular place—it’s always busy and fairly bursting at the seams. Adam says that their business wouldn’t be possible if they didn’t have such an amazing team of people behind them.